We have been limited in sharing details of the FPB 97-1. In this post we will give you a quick overview of a few of the more interesting design and construction aspects. The photos speak for themselves, so the copy will be short. 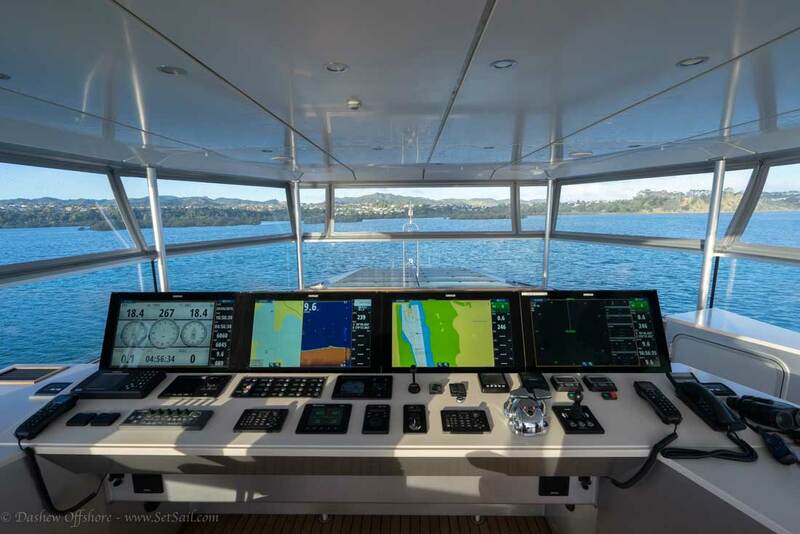 There are two parallel Simrad EVO navigation systems. 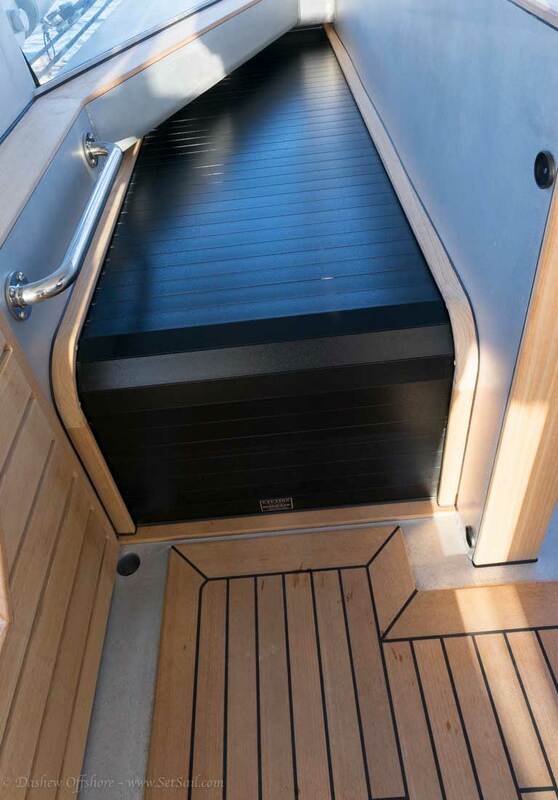 The FPB 97 is typically conned from the Matrix deck (shown above). 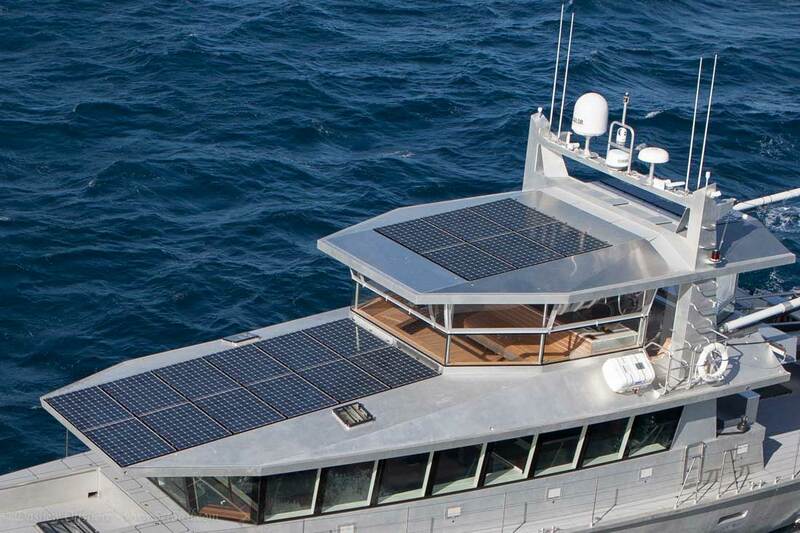 FPB 97-1 has her Matrix deck fitted out in a combination of aluminum, paint, and bare teak. 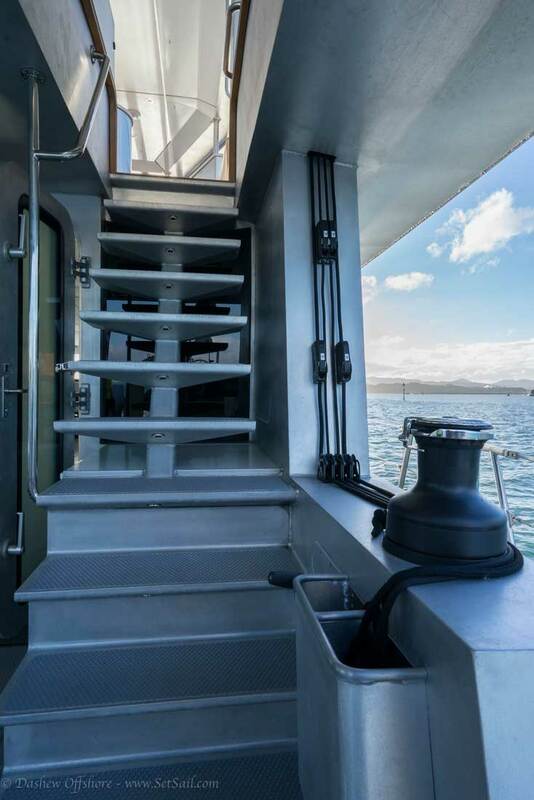 The stairway leading to the main deck has a simple but effective closures system. The next series of photos is of an idea the owner suggested, which was then engineered by Circa. This is a life boat-like, hydraulically operated set of dinghy davits. Launching and retrieval can be single-handed when required. When the davits are outboard the deck is clear. Now a few aft deck items. Control lines for boom angle, at-anchor flopper stoppers, and boom halyards. We have switched our foremast lights to LED and they are both bright and small in cross section. 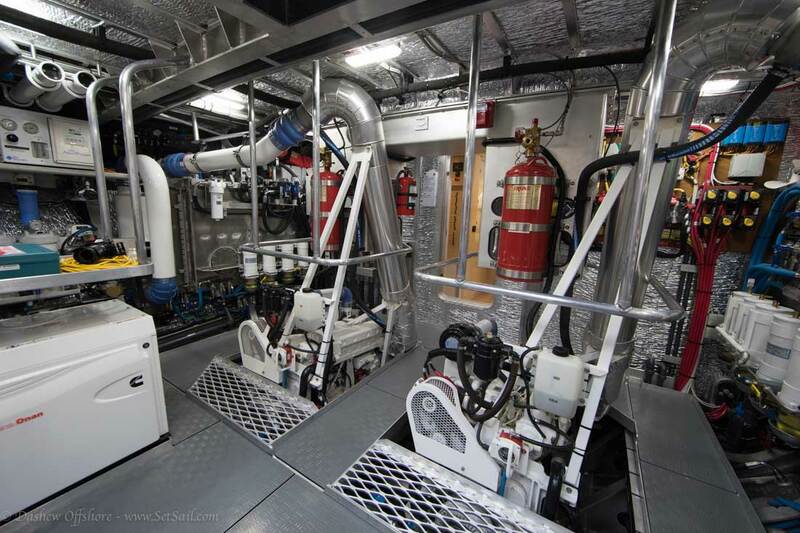 A somewhat distorted panoramic view of the engine room. 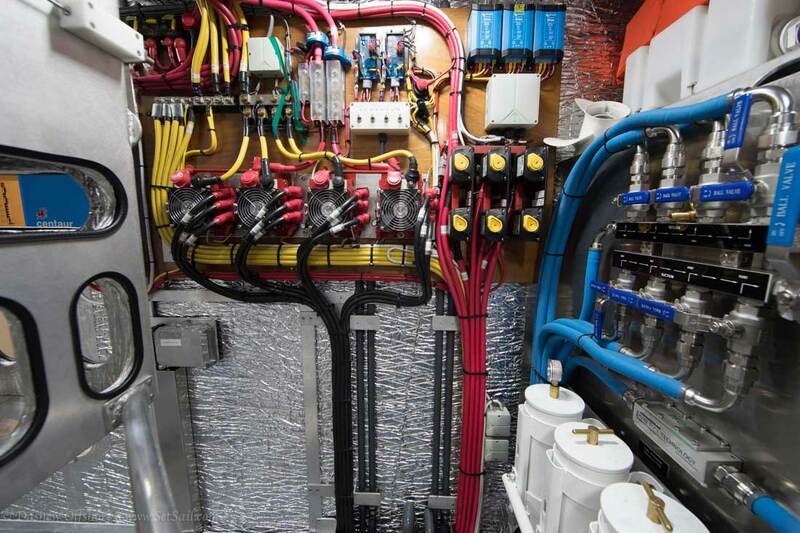 DC alternator rectifiers, controls, and voltage controllers are on the bulkhead. Fuel filters on the starboard day tank along with fuel polishing manifold valves are outboard. Coming back to the dock after a long day of testing. This entry was posted on Monday, May 18th, 2015 at 7:38 am and is filed under Dashew Logs, The Logs, three, Wicked FPB 97. Both comments and pings are currently closed. Hi Steve: Thank you very much for this update: a hugely impressive vessel. I’m wondering if two aspects (can be made to) apply to FPB 78: the (presumably hydraulically powered?) davit and the aft-deck seating? Aft deck seating is a on FPb 781 and 783. 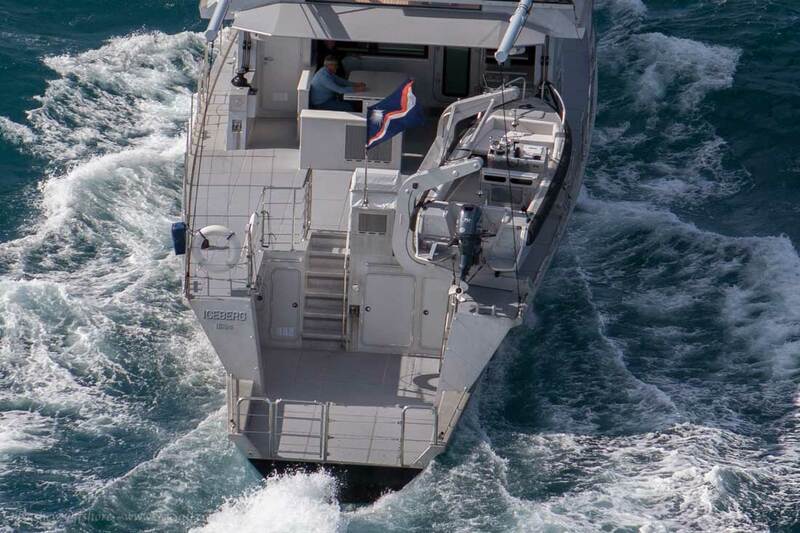 The davit system is designed for a very heavy dinghy and is a bit out of scale for the FPB 78. A new unit could be engineered and Todd can you a price indication if you get serious about a boat. Three quick questions. 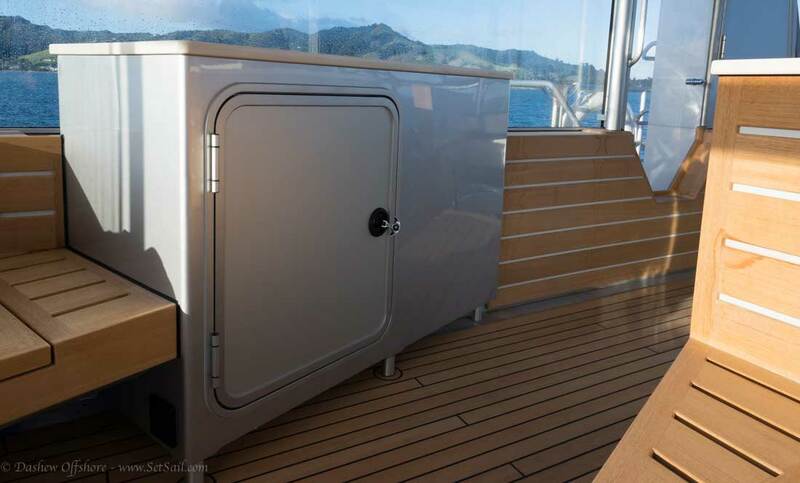 Is the port side aft deck door lead to a wet locker, engine room or a head? If you loose hydraulics on the davit, can the launch be accomplished using the boom with the tender sitting on the davit chocks? In your esteemed experience; how long do think it will take the Matrix Deck teak, it being under cover, to begin to turn? It is beautiful, both in nature and installation, but looks like a labor intensive proposition long term. The booms can be used to launch the starboard dinghy should the davits go awry. That door under the overhang on the port side is a day head. Finally, the issue with the teak is more one of spills than sun or salt water. Since the teak is effectively inside I woud guess a year or so before the color starts going grey. 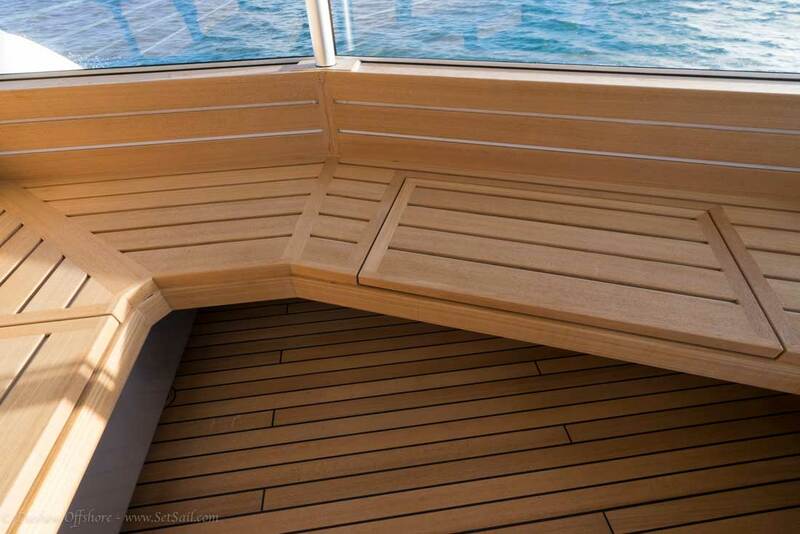 I love the teak look but it doesn’t quite mesh with the ruggedness and low maintenance ethos of the rest of the boat, do you have any experience with any of the synthetic teak alternatives like NuTeak? They talk a big game in terms of authentic appearance and hard wearing longevity but I have no real world experience. We have no experience with the faux teak. If any of our SetSail readers do have experience with it we’d love feedback. I really like the dinghy launching system & the stern platform. It just makes everything so easy. 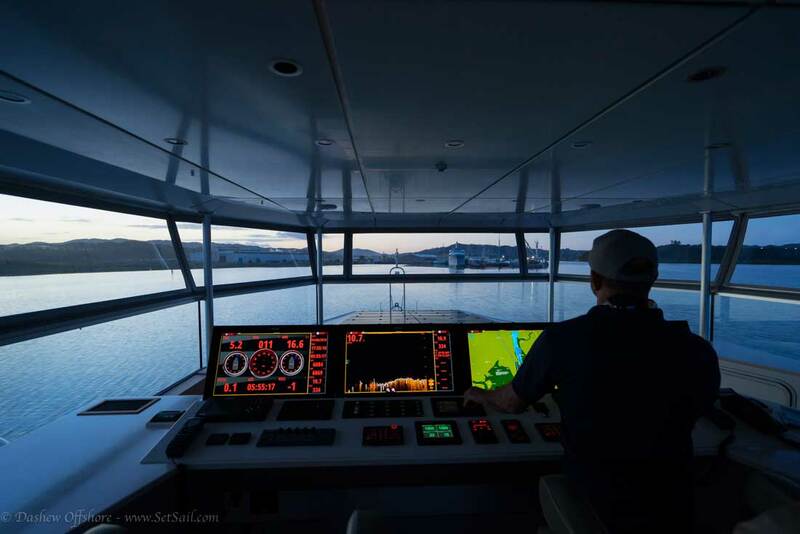 Not to mention that looks like a great place to sit & dangle your feet in the water & watch the sunset while anchored in a quiet cove somewhere. I would probably make a seat I could easily pull out of storage & plug in so I had a comfy place to sit right next to the water. Can’t find a better thread to ask the question on, given your discussions in the past to go with seawater cooling and wet exhausts I am wondering if you have considered the situation of deliberately or accidentally wintering over in an arctic region. Will you lose all use of gensets once the sea ice reaches the seachest and how would sea ice effect the wet exhausts? 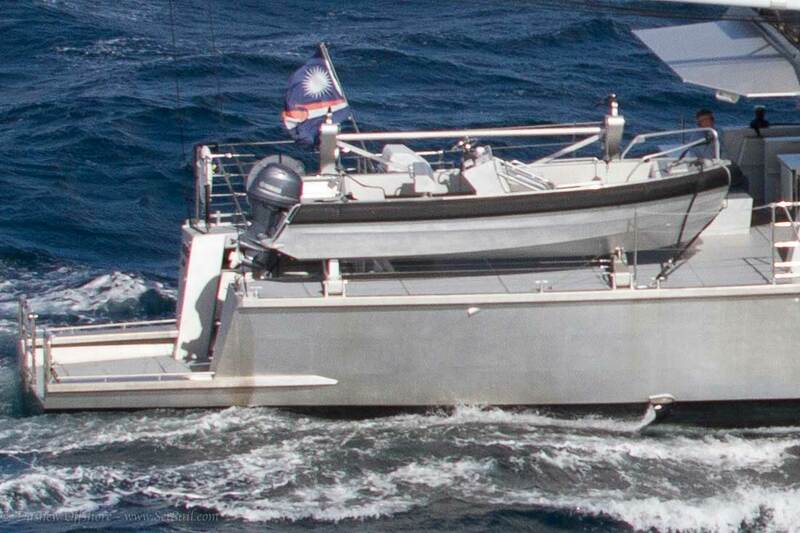 Wintering over is not part of the spec for the FPB 97-1. However if this were to change running the gensets with a dry stack and internal heat exchanger could be done with relative ease. First – you guys rock. Your love of boating is awesome and your generosity in sharing the info is even awesomer. Second – world’s greatest hammock needs to be made. 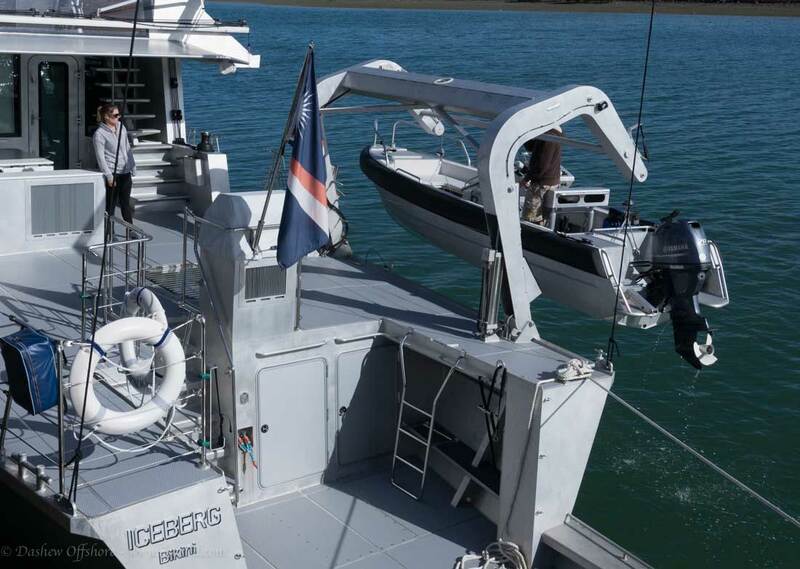 Attached to the dingy davits for use in secluded anchorage. Need remote for davits. 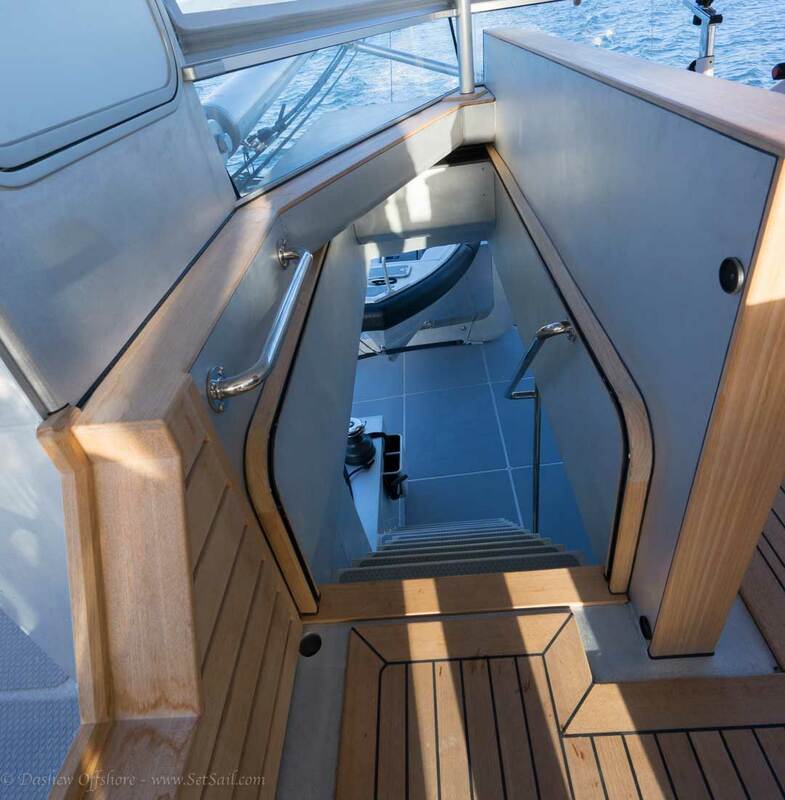 Enter hammock when davits on deck, use remote to lower yourself over water, presto, coolest hammock on the seas. Hammock will of course need a drink holder. Maybe even a small cooler. 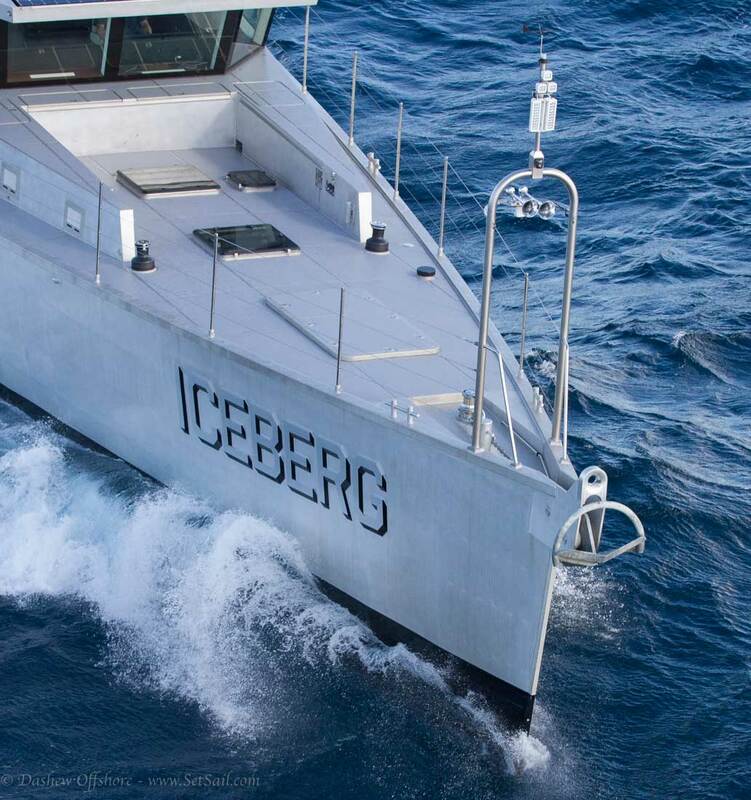 Hi Steve, Referring to our previous communication regarding the radar installed aboard Iceberg. 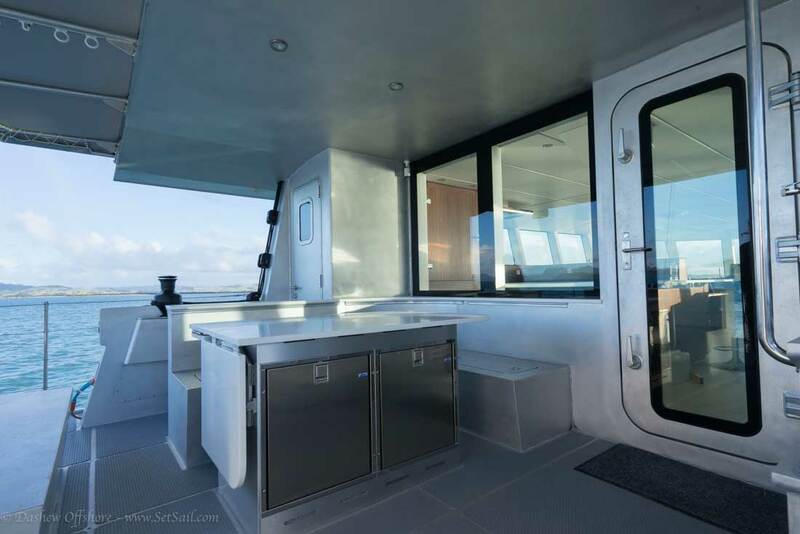 You mentioned that the owner was waiting to install a Simrad HALO unit. These are all open array antenna units. Is it intended that the antenna be mounted to the pad below the existing broadband antenna? If not, it looks like the current mount for the existing radar antenna/FLIR camera/masthead light will have to be reworked. If you anticipated this and had Circa put the pad in place, kudos to you. A second open array radar has been in the plan from the beginning. Thank you so much for letting us see the boat we have all been anticipating the past couple years. FPB Design details are great and I cannot imagine much better craftsmanship anywhere. I’m missing a proper helm from all the photos from the first FPB onwards! There is always a manual system, but normal steering is with a hydraulic pump electronically controlled.